A question I frequently hear is “What’s the difference between search engine marketing (SEM) and search engine optimization (SEO)?” And while some business owners are interested in the technical differences, it’s often the case that the real underlying question is “Which is better for my business – SEM or SEO?” And, like most things, the answer is complicated, so let’s start with the basics. What is the Search Engine Results Page (SERP)? The Search Engine Results Page (SERP) is what you see from a search engine, such as Google or Bing, when you search for a phrase. Before discussing the difference between SEO and SEM, it’s important to understand the layout of the SERP. To the right are the results for a search of “tree trimming services near me” from my laptop. There are two key points to understand. The first is that the results are broken up into 3 distinct areas, each with its own characteristics. Below the paid ads is a map with 3 business highlighted. This is usually referred to as the “Google local pack” or the “local 3 pack” which is designed to feature local businesses. Getting your business listed here falls into the SEO realm. Finally, below the paid ads and the local 3 pack are the traditional “organic” results. As mentioned above, there are two key points to understand and the second point is search engine results page varies based on user, device, and location. To illustrate this point, the second screen shot shows the results for the same phrase from my phone, which is sitting 12 inches from my laptop. While the overall layout is basically the same, the listings are different. For example, Schulte Farms shows on the laptop version of the local 3 pack but not on the mobile results. You’ll also notice that the organic listings show in a different order. The key takeaway for this second point is that search results are not static. Aside from differences based on device, you will also find that results vary by user and the results are influenced by activity. For example, I frequently talk to clients who see their websites showing high on the SERP and think everyone sees the same. I then take a screen using a browser with a “clean” history and show them a different view. A final note here is that the results shown are only for Google. Users searching on Bing would see an entirely different picture. Since Google dominates search, commanding around 2/3 of the market share, my comments here are focused on Google. As discussed back in February, search engine marketing is often referred to as pay-per-click (PPC) or cost-per-click (CPC) advertising. The key concept is that you bid on specific phrases and, assuming you bid enough on relevant terms, your ads then show. Based on the layouts shown here, you can immediately see the appeal of SEM. Paid ads run on Google AdWords offer the opportunity to have your product/service appear at the very top of the page when someone is doing a related search. In other words, you can put your ads in front of an interested prospect when they are thinking about taking an action. It’s about targeting the right person at the right time. Simply put, search engine optimization is the process of improving your website so it shows higher on the search results page in order to maximize the number of qualified visitors to your website. There are two key concepts inherent in this explanation. The first is that this is a process, not a single action. Optimization is not the “set it and forget it” oven but instead an ongoing series of steps where actions are documented, measured, and evaluated. The second concept is that you are targeting qualified visitors. You want to rank for keyword phrases that are relevant to your business AND have enough activity to make it worth your while. After all, it’s relatively easy to rank for an obscure phrase that few search, but that won’t yield bottom-line results for your business. Keyword research is a fundamental aspect of SEO. 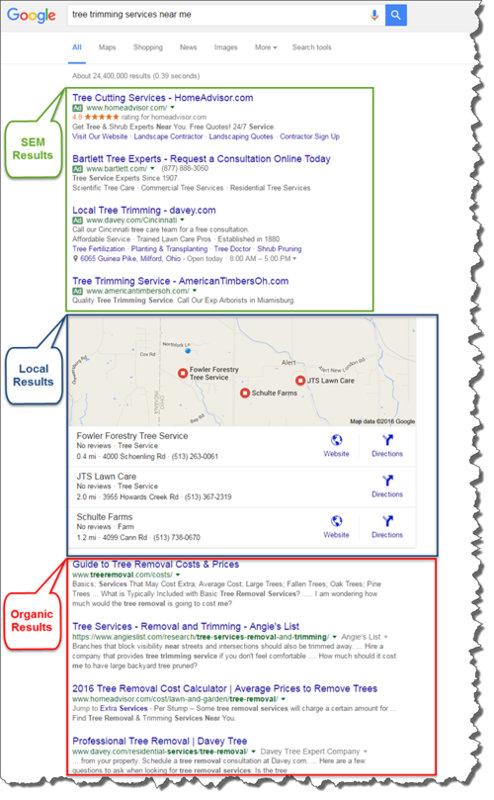 From a technical perspective, both the local 3 pack and the traditional listings below are considered to be organic listings, and websites make this list by being “optimized” for search engines. The appeal of SEO is that it’s sometimes thought of as “free traffic” as you don’t have to pay for every click. However, it’s rarely the case that a site makes the top of page 1 on search (where the most traffic is to be had) without doing quite a bit of work. Site audits are important as they give you a benchmark of where you are, and more importantly, reveal the current strengths and weaknesses of your site. There is nothing worse than making changes that hurt something that was already working. Once you have your audit, you can develop the strategy which should extend beyond the goal of simply “ranking” high. You want to make sure the right page is showing and that this page is optimized to convert visitors in some fashion. For example, a simple conversion is having someone buy something on the page. However, it should be noted that the process can be much involved. In situations where there’s a long sales cycle, the best conversion event might be to have someone sign up for a demo or simply to capture an email address so the visitor can enter a lead-nurturing program. As alluded to above, the primary differences are the placement and process for getting listed. Generally speaking, the turnaround time for SEM is fairly quick. In many cases, small campaigns can be up and running in a matter of days. In comparison, the SEO process is a marathon compared to SEM’s sprint. It can take months (or longer for new websites) to work their way up the organic listings. One of the biggest myths is that SEM is expensive while SEO is cheap. While it’s true that SEM does require you to pay for each and every click, and some keywords require very high bids, SEM campaigns can be run for modest budgets. And, once optimized, SEM campaigns can be (and should be!) ROI positive. The myth that SEO traffic is “free” stems from the fact that you don’t pay for each click. However, as noted above, there is sweat equity involved and you are either paying for that in terms of having someone else do it or the opportunity cost involved of you doing it yourself. The amount of traffic depends on where your website shows in the listing. At the very least you need to target being on the first page. To get real traction, you need to be at the top of the listings. Attaining a top listing requires content, a properly structured website, and an optimization program – all of which takes time and effort. An objective discovery process can be very helpful in determining which is a better fit. I am surprised by how often I hear from business owners who believe that they need SEO but haven’t even considered SEM. For example, in one situation, I spoke with a team that had just entered a new market, with a new domain, and needed to engage with prospects immediately. A situation like that tends to better suited for SEM, where campaigns can be set up quickly and the company can start seeing results. However, framing this as an “either/or” question misses one of the biggest opportunities. In remarketing, the SEM and SEO are working together. A visitor finds your business through your SEO efforts and then SEM is used to show relevant ads. Remarketing can be especially helpful in situations where a user is doing initial research but not yet ready to buy. And one of the key advantages to remarketing campaigns is that they can often be run for a very modest cost since the targeting is extremely refined. This piece only scratches the surface in terms of both the depth and playing fields discussed. Explanations of both SEM and SEO can, and should be, explored in more detail before implementing either. Also, the field is not limited to just running paid ads on Google AdWords. Both LinkedIn and Facebook offer extremely interesting pay-per-click ad platforms that allow detailed targeting in different ways. It’s often the case that testing is required to achieve optimal results but an experienced digital marketer can help shorten that learning curve.